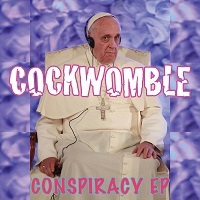 I have to admit that, after the verve, vim and promise of ‘All Of The Money…’, I’m somewhat disappointed by ‘Conspiracy’. It sounds like a band treading water, sticking out a collection of songs to keep the momentum going without really putting the best that they can into it. Having said that, it does get off to a reasonable start, thanks to a gnarly, rumbling bass line from Vicky before it descends into a sub-Beasties style rap-rant, saved only by the continuing effectiveness of the driving bass line, which is played slightly faster than the rest of the song, and Ali’s stabbing guitar. The Beastie Boys comparisons continue with ‘Goebbels & Orwell’ (which, like the title track, is repeated at the end of the EP in a shortened ‘radio edit’ format), with the song again saved by the duality of the driving bass and shrieking guitar interventions. ‘It’s OK To Punch A Nazi’ continues the anti-fascism theme expounded in the previous track, with its self-explanatory message and is the first “proper” punk song, with its pummelling rhythm and aggression-filled vocal while they definitely save the best for last, in the form of ‘Joey Ramone’. The song is specifically targeted at Bono, whom the band describe as having “committed many crimes”, but perhaps the worst of them being the U2 frontman’s song about Joey Ramone, which they lambast as “an affront to music itself let alone just punk”. The result is a joyous romp and a fitting tribute to the original bruva, and is the only hint of the ‘Wombles continuing along the path mapped out on their previous release. As mentioned above, the EP is rounded out with two radio edits, which will be of interest only to DJs and the like, and otherwise serve no other useful purpose (although the remix of ‘Conspiracy’ is somewhat heavier than the “original” version). As I said, I was disappointed at the loss of momentum which seems to have been displayed by ‘Conspiracy’: hopefully, the band can regain it soon and get that visceral attitude displayed on ‘All Of The Money…’ back into their collective arsenal. ‘Conspiracy’ is out now. You can get your copy HERE.